I can't believe that yesterday was the first day of school. Summer seemed to fly by so quickly this year. I think part of it was that we didn't get "summer" weather until the last few weeks. It is always a happy and sad day for me when the kids go back to school. Happy because they love it. They are ready to get back into a normal schedule, see their friends, and okay, mostly see their friends. Happy for me because I have to admit, I love the quiet house! Sad because there is no more sleeping in, and it is another milestone in their lives which quietly points out that they are growing up too fast. The boys weren't thrilled to have to get their picture taken for the blog, but I did get "smiles" out of them. Tyler is a junior this year. I can't believe it! Its ACT/SAT time and time to start the serious look at colleges. He is taking 3 AP classes, and is in ASB. I am hoping we survive this year! 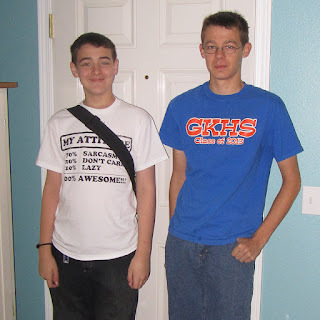 Travis is officially a high school student as well, starting his freshman year. He lucked out and is able to take his advanced Algebra at the jr. high, and doesn't have to run to the high school campus like Tyler did. He is thrilled to be in Mrs. Elliff's honors class again, and I am too. Both boys will have had her for their 7-9th grades. The girls were more happy to pose for me. 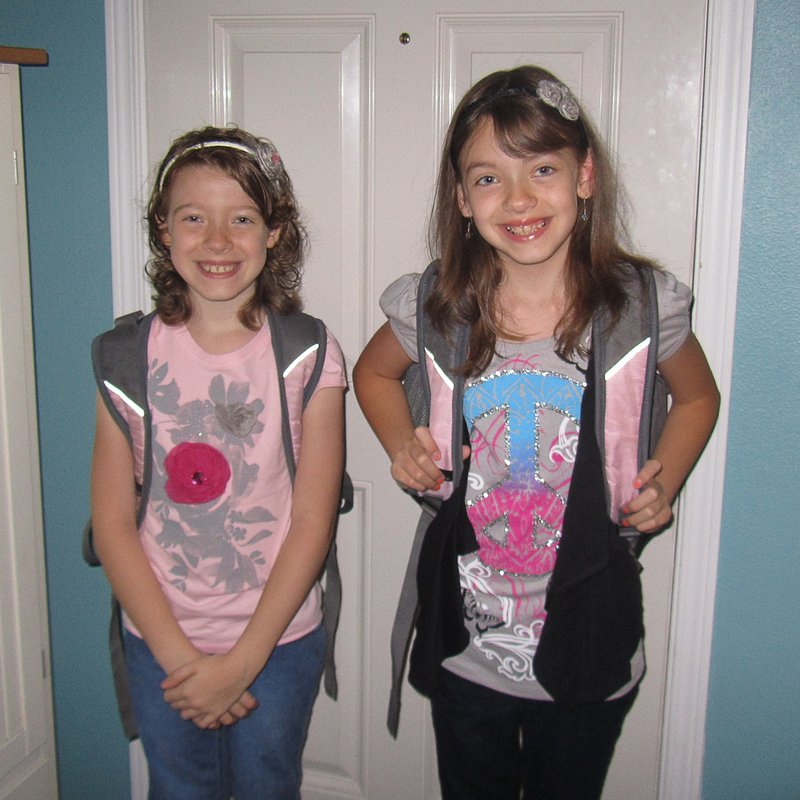 I literally finished their hair bands just minutes before I took the picture and sent them out the door to catch the bus. :) Both girls have the same teachers they did last year. Our school is trying it out, and I have to say I love the idea. The girls and their teachers already know each other, so the first few weeks aren't all about figuring out the learning/teaching styles of each other. Daylyn is in 6th grade and is looking forward to another fun year. She can't wait for choir to start. Allison is in 4th grade. She came home so excited because she already made three new friends. So far the year is off to a great start, lets cross our fingers that it will be smooth sailing all year long! Aww look at the smiles, give the girls a hug for me and tell them I was sorry to not be able to visit more. Miss you! I love the pictures! Every single one of them looks so much older to me. :( Ally's hair looks great! Oh, and I want you to take close up pictures of the girls headbands and send them to me please. Tell them all I love them! Great pics and it does all go by so fast! I found myself last week taking pics of my grandchildren in front of the house like i did every year with my own children. How did that happen? ?